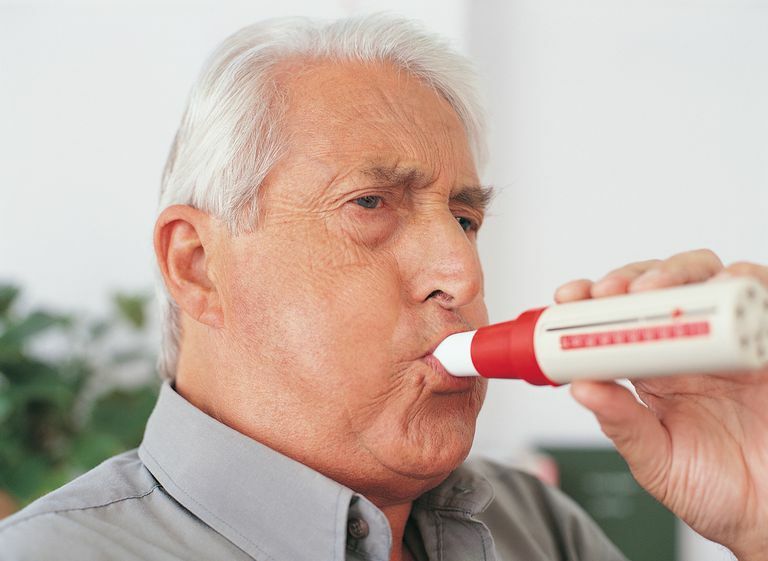 In diagnosing and treating obstructive lung diseases such as chronic obstructive pulmonary disease (COPD), doctors often use various tests to determine the severity of the disease. One of these is a test called a spirometry, in which various measurements of lung function can be calculated. One important measurement doctors use to monitor lung function is the ratio of forced expiratory volume in one second (FEV1) over forced vital capacity (FVC), also known as the Tiffeneau-Pinelli index. This is a measurement of the amount of air exhaled forcefully in one second compared to the full amount of air that can be forcefully exhaled in a complete breath. The amount of air you exhale in one second is recorded as well at the total amount of air you are able to exhale. Based on the number of FVC calculated for your age and size, the ratio of these 2 values is then evaluated. Ordinarily, the two values are proportional. If the FVC is decreased, then the ratio is looked at more closely. Pulmonary fibrosis, such as idiopathic pulmonary fibrosis, a scarring of the lungs of uncertain cause. Ascites, a fluid buildup in the abdomen due to liver disease or cancer in the abdomen can cause a restrictive pattern by limiting the ability to take a deep breath. If a restrictive pattern is observed, doctors will usually recommend full pulmonary function tests to further characterize your lung disease. If an obstructive pattern is found, the next step is usually to recommend treatment with a bronchodilator, a medication which helps to reduce constriction of the airways and repeating the test. If you are being treated for obstructive lung disease, your doctor will most likely monitor your progress using your FEV1/FVC ratio. If the ratio improves with a bronchodilator, that means that the obstruction is at least partially "reversible." This is seen with conditions such as asthma. If the ratio does not improve with a bronchodilator, it may be irreversible, such as in COPD. Godfrey, M., and M. Jankowich. The Vital Capacity Is Vital: Epidemiology and Clinical Significance of the Restrictive Spirometry Pattern. Chest. 2016. 149(1):238-251. Johnson, J., and W. Theurer. A Stepwise Approach to the Interpretation of Pulmonary Function Tests. American Family Physician. 2014. 89(5):359-366. Koo, K., Yun, H., Byeong-Ho, J. et al. Relationship Between Forced Vital Capacity and Framingham Cardiovascular Risk Score Beyond the Presence of Metabolic Syndrome: The Fourth Korea National Health and Nutrition Examination Survey. Medicine. 2015. 94(47):e2089. Why Does Your Doctor Want to Measure Your Expiratory Reserve Volume?